The Swiss Arab Network in association with the Arab-Swiss Chamber of Commerce and Industry, the Swiss Business Council, the Swiss-Asian Chamber of Commerce, the Union of Chambers of Commerce and Switzerland Global Enterprise are honored to invite you to an unforgettable elite charity event with a unique inspiring atmosphere for high-level exchange. 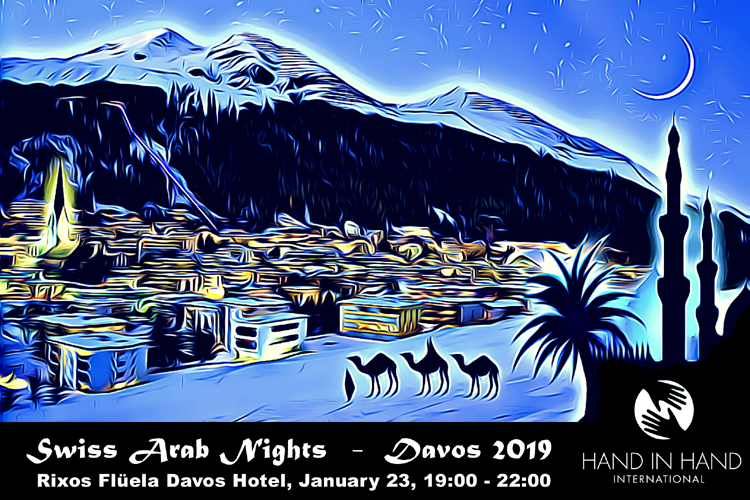 Swiss Arab Nights 2019 is an exclusive reception striving to promote partnerships, deepen economic relations, and intensify cultural exchange between Switzerland and the Muslim world during the WEF 2019 in Davos. In case you missed it, here are some impressions of the last edition of our Swiss Arab Nights. This year’s Swiss Arab Nights will be dedicated to Hand in Hand International, a not-for-profit that fights poverty and gender inequality with jobs. Worldwide Hand in Hand has nurtured the creation of more than 3.6 million jobs and 2.4 million microenterprises. Empowering women and improving financial resilience contributes to the health, safety and prosperity of their families, communities and the world. Our guest list includes again thought leaders, top CEOs, board members, public figures, UHNWls and recognized personalities from all over the globe. Expect to enjoy high-level networking in our winterland oasis and get engaged with like-minded leaders while helping Hand in Hand to create sustainable microenterprises empowering women to change the world. Reservation required. Strict invitation only event! VIP Tickets only 1’500 CHF. For any questions please contact rsvp@swissarabnights.org. Reservation deadline Jan 20, 2019. Very limited tickets, early RSVP recommended.